Since 2009, the number of unaccompanied minors apprehended crossing the U.S. border has sharply increased. The journey for these children is long, expensive, and dangerous. What is the cause of this sudden influx of young immigrants? On this episode of Lawyer 2 Lawyer, hosts Bob Ambrogi and J. Craig Williams interview Alex Nowrasteh from the Cato Institute and Elizabeth Dallam from Kids in Need of Defense (otherwise known as KIND). Together they discuss the immigration numbers, reasons for seeking asylum, and suggested policy changes. Tune in to learn how immigration is affected by Central American gangs and the War on Drugs. Alex Nowrasteh is the immigration policy analyst at the Cato Institute’s Center for Global Liberty and Prosperity. Previously he was the immigration policy analyst at the Competitive Enterprise Institute. Among many publications, his work has appeared in The Wall Street Journal, Houston Chronicle, and Boston Globe. He has appeared on Fox News and numerous television and radio stations across the United States. He received his B.A. in Economics from George Mason University and Masters in Economic History from the London School of Economics. Elizabeth Dallam is the National Legal Services Director at Kids in Need of Defense (KIND) which is a program providing pro bono legal services to children who arrive “unaccompanied” or alone to the United States. Previously, she served as the Senior Protection Officer at the United Nations High Commissioner for Refugees in Washington, DC. During her tenure at that organization, she acted as the agency’s focal point on unaccompanied children and advocated for systemic reforms in law and policy to better protect children. Prior to that, Elizabeth was the Executive Director of the Florence Immigrant and Refugee Rights Project in Arizona, where she started a children’s representation project. Elizabeth Dallam: … it’s really a mark of the desperation that these parents feel, and as one mother said, “I would rather have my child die on the journey than on my doorstep.” They see that it’s their only hope, even though they know it’s a very dangerous route, and I can only imagine what they go through in making that decision to put their child in the hands of smugglers, and it is an extremely dangerous journey. Welcome to the award winning podcast Lawyer 2 Lawyer, with Craig Williams and Robert Ambrogi bringing you the latest legal news and observations with the leading experts in the legal profession. You’re listening to Legal Talk Network. Craig Williams: Hello, and welcome to Lawyer 2 Lawyer on the Legal Talk Network. This is Craig Williams, coming to you from sunny southern California. I write a blog called May it Please the Court. Robert Ambrogi: And this is Bob Ambrogi, who normally comes to you from Boston, Massachusetts, but today I’m not. I’m at the Legal Talk Network headquarters, here at Denver, Colorado. I’m very happy to be out here. Craig: That’s pretty exciting. I’ve never actually been there either. Before we introduce today’s topic, we’d like to thank our sponsor Clio, an online practice management software program for lawyers at go Clio dot com. Robert: Craig, as you know in recent news there’s been a lot of reporting on unaccompanied minors crossing the border from Mexico into the United States. The reports indicate that a large percentage of these children are traveling as far as south as Central America. It appears from the reports the statistical trends for these instances in increasing, that there are reports of agencies being overwhelmed by the sheer numbers. There are a lot of questions about what’s causing this mass migration and what the response of the United States should be to the situation. Craig: Here to discuss this topic, we welcome Alex Nowrasteh. He is the immigration policy analyst at the Cato Institute Center for Global Liberty and Prosperity. Previously, he was the immigration policy analyst at the Competitive Enterprise Institute. His work has appeared in The Wall Street Journal, Houston Chronicle, and The Boston Globe. He has appeared on Fox News, and numerous television and radio stations across the United States. He received his BA in Economics from George Mason University, and his Masters in Economic History from the London School of Economics. Welcome to the show, Alex. Alex Nowrasteh: Thank you very much for having me. Robert: Also joining us today, we have Elizabeth Dallam. Elizabeth is the National Legal Services, director at the organization Kids in Need of Defense, otherwise known as KIND, which is a program proving pro bono legal services to children who arrive unaccompanied, or alone, to the United States. Previously, Elizabeth served as the senior protection officer at the United Nations High Commission for Refugees in Washington DC. During her tenure at that organization, she acted as the agency’s focal point on unaccompanied children, and advocated for systemic reforms in law and policy to better protect children. Prior to that, Elizabeth was the executive director of the Florence Immigrant and Refugee Rights Project in Arizona, where she started a children’s representation project. Welcome to Lawyer 2 Lawyer, Elizabeth. Elizabeth: Thank you so much for the opportunity. Craig: Alex, let’s start with you. Let’s give our audience a little bit of perspective about the situation. Please briefly tell us about the Cato Institute, and what its stance is on immigration issues. Alex: Yeah. The Cato Institute is a libertarian think tank in Washington DC, and we have scholars who work on every single policy issue, from that perspective, and I work on immigration policy, and the policy recommendations that I make have to do with making it easier for immigration, for legal immigration, to the United States, increasing the pathways for people to come here legally, both as workers and as family members … Find some way to legalize, hopefully on a path to citizenship, the unauthorized immigrants that are here in the United States, and try to scale back some of the more intrusive portions of immigration enforcement that we feel are a threat to American civil liberties as well as to the civil liberties of immigrants. Robert: Elizabeth, the same question to you: tell us a little bit about KIND and the work it does on immigration issues. Elizabeth: KIND was founded by the Microsoft Corporation in partnership with Angelina Jolie, who is also the UNHCR goodwill ambassador, and I worked with her on these issues when I was at UNHCR, a UN refugee agency, and they came together to see what the probate sector could do in partnership with the US Government to meet the needs of children, who arrive alone to the United States, while they’re in deportation proceedings, and to ensure that every child who is going through those very complex proceedings … immigration law has been likened to the tax law in complexity … that they all have an attorney to represent them in those proceedings. Also, to ensure that they receive protection, humanitarian, or refugee protection, for which they may be eligible under US laws, and then finally, to ensure that for those who are not eligible for any protections, and who must be returned to their home country, is that they are returned safely, and in a way that promotes their reintegration into the community and would not promote them to migrate again, so programs in the home country. Craig: Alex, you’ve … some of the study entitled Unaccompanied Minors Crossing the Border – The Facts, your study was based on figures provided for the US Customs and Border Protections. In terms of trends, what are we seeing in terms of immigrants crossing the border illegally and how many of those are unaccompanied children? Alex: What we see … I think a little bit of history is in order … we’ve seen a very steady decline in the numbers of unauthorized immigrants being apprehended coming across the south-west border, since about 2005, and 2006, those years … and the number of apprehensions is probably the best proxy measurement that we have for the numbers and intensity of unlawful immigrants trying to cross the border, so we saw in 2005, and 2006, over a million unauthorized immigrants apprehended by Border Patrol at the border. In 2013, we saw just 414,000 apprehended, so between2006 and 2013, obviously a lot has happened in the United States, there has been quite a severe recession, low economic growth, since then, as well as stepped up border enforcement, so as a result of those 2 factors, primarily the recession, we’ve seen a large decrease in numbers of people trying to come into the United States unlawfully across the south-west border. The largest decrease being Mexicans who have really slowed down unauthorizedimmigrant rate coming across the border. However, for Central Americans, in total, there is just a slight dip in 2010 and 2011, and otherwise, a fairly steady increase in the number of unauthorized immigrants from those countries coming into the United States during that period. During this time period we have also seen a large increase in the numbers of unaccompanied minors, that is, minors coming across the border by themselves that are apprehended by Customs and Borders Protection, or just encountered by Customs and Border Protection. In fiscal year 2009, according to CBP, about 19,000 or so unaccompanied minors were encountered by CBP. For the last year, unfortunately, our full data, which was 2013, 38,000 came across, so that was a doubling, and so far, in this fiscal year, there’ve been just about 50,000, and we still have several months to go, with some estimate’s estimating that we could get up to 90,000 total number of unaccompanied children. You’ve seen, just since 2009, about … a rapid increase in the number of unaccompanied children coming across the border, and the big increase has been from Central American countries, like Honduras, Guatemala, and El Salvador especially, we have seen quite a large number. The number of Guatemalans unaccompanied children, for instance, went up for about a thousand to almost 12,000, and this year so far, Hondurans from less than a thousand up to over 13,000 this year. Meanwhile, the number of Mexicans has fallen from 16,000, 2009, to about 11,500 so far in 2014, so these are the trends that we’re seeing so far. Robert: Elizabeth, does that reflect what you’re seeing? Do those numbers sound right to you? How do you explain this? Why is this happening? Elizabeth: Yes, it does sound right to me, and I think that the reason that they number of unaccompanied children is going up relates to all of the data that Alex mentioned, which is that the number of individuals from Central America overall is increasing, and the majority of these children are from Central America, primarily Honduras, El Salvador and Guatemala. That is the majority of the clients that we are serving nationwide. The reason that this is happening; this is really a regional refugee humanitarian crisis. What we are seeing is that numbers are not only up from these 3 countries in the United States, they’re up in the region. The UN Refugee Report … agency reports that the number of individuals from Central America, and children, in particular, from Central America, in that … in the whole region has been going up. For example, Mexico, Panama, Nicaragua, Costa Rica, and Belize saw a 712% increase in the number for asylum applications from citizens of these 3 countries. What’s happening is, in these countries is a dramatic rise in violence. These 3 countries are for … are 3 out of the top 5 in the world, in terms of murder rates. Primarily, it’s gang violence that is plaguing these countries, and children, within these countries are the most vulnerable. The gangs are specifically targeting them to join their ranks, and refusal can escalate to killing them, and girls to be their sexual slaves. It’s a very, very serious, to me, refugee crisis. They’re also … Some of the children are fleeing domestic abuse situations as well, but the majority that we see are really afraid of the gangs. Craig: What about the parents? As a parent myself, I can’t imagine sending my kids across the border unaccompanied. Any contact, and word, or any kind of sense of why they’re letting their children go, or are the children just running away? Elizabeth: It varies. Sometimes it is the children that are making the decision because they are not safe. Sometimes there is no parent in their lives, no parental caretaker, and when there is a parent, it’s really a mark of the desperation that these parents feel, and as one mother said, “I would rather have my child die on the journey than on my doorstep.” They see that it’s their only hope, even though they know it’s a very dangerous route, and I can only imagine what they go through in making that decision to put their child in the hands of smugglers, and it is an extremely dangerous journey. Alex: Yeah, and I think that push factor of the violence explains certainly a large amount of the number of children fleeing these countries and coming to the United States. An under reported reason, though, is also with the pressure of family reunification in the United States. Citing the UNHCR report fall out, last year, that came out, it surveyed 404 of the … unaccompanied minors apprehended in the border along the United States, and they asked them a series of questions a battery of questions. Elizabeth is, of course, very familiar with this. The asked a series of questions, and one of the questions was do you have one or both parents living in the United States currently? For Salvadoran children, it’s 49%, at least one parent, Guatemalan 27%, Honduran 47%, Mexican 22%, with about 36% of all these kids saying that they had at least one parent in the United States. I think the reason why this is significant is since 2005, the number of unauthorized immigrants in the US, from the Central America countries has risen by over 60%, and one of the patterns of migration that we’ve seen throughout history to the United States is that oftentimes one of both parents will come first and leave their kids behind, hopefully with a caretaker, but sometimes not. They will get established in the United States and then send for their children when they are able to financially send for them, and there’s usually a delay of a few years here, so what we saw was the collapse … or the decrease in the Mexican children who were coming across unaccompanied occurred a couple of years after Mexican illegal immigration slowed down dramatically. Now we’re seeing this rise in unauthorized immigrant children who are reuniting with their unauthorized immigrant parents from Central America in the United States, and that explains … that must explain a portion of it as well. Elizabeth: I would agree with that. It does explain a portion, but I think rather than … In some circles, rather than that being under reported, I think it may be seen as a major pull factor, and as you know, the UNHCR study … It demonstrated that children had a variety of motives for leaving, and family reunification was definitely one of them, in a high number of the cases, but it was also cited in many of the cases in which it was the violence that also pushed them to leave. It is a complex situation. Alex: One of the other factors … sorry just to chime in really quick, because this other factor is said frequently way too often, is the change in US laws, or enforcement priorities that are so … supposedly incentivizing a large number of these children to come, and the rhetoric we hear oftentimes is that the Obama administration has given a free pass, so all these children are coming, because they think they can get a free pass. In the HCR study, only 9 out of the 404 respondents even mentioned US law having to do at all with any of their decisions, and certainly wasn’t the most important reason for almost all any of them, and that’s over just 2% of the respondents. It’s really ridiculous right now how much play that justification is getting in the media relative to the almost insignificant importance it must play in pulling unauthorized, unaccompanied minors here. Craig: Let me interrupt you here, because we need to take a quick break, and before we move onto our next segment, you will hear a message from out sponsor. We’ll be right back. Kate: Hi, my name is Kate Kenny from Legal Talk Network, and I’m joined by Jack Newton, President of Clio. Jack, takes a look at the process of moving to the cloud. How long does it take to move to the cloud, and is it a difficult process? Jack: No, with most cloud computing providers, moving your data into the cloud is something that takes just minutes, not hours or days to do. You can get signed up and running with most services in just a few minutes, and even if you have an existing legacy set of data that youth leaders want to migrate to a web based practice management system like Clio, there’s migration tools and migration service that we’re able to offer to ease that process. Most firms can be up and running in the cloud in less than 5 minutes, and can have their data imported in a matter of hours or days. Jack: Thank you, and if you’d like to get more information on Clio, feel free to visit w w w dot goclio dot com: that’s G O C L I O dot com. 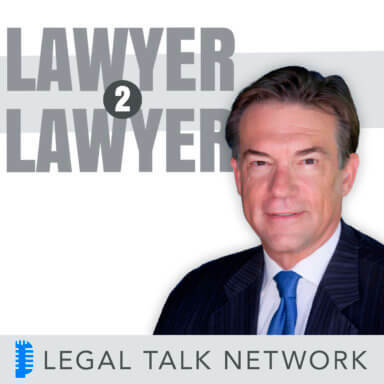 Robert: Welcome back to Lawyer 2 Lawyer on the Legal Talk Network. This is Bob Ambrogi, and joining my co-host Craig Williams and I today are Alex Newrasteh, from the Cato Institute, and Elizabeth Dalla from KIND. Elizabeth, tell us about … What is the legal status of these unaccompanied minors? Is it different than others who are coming across the border? Elizabeth: Under US law, an unaccompanied child, unless they are from Mexico must be placed into immigration removal proceedings before an immigration judge. Adults can be subjected to what’s called expedited removal, so they’re screened for an asylum claim, and if they do not have one, they can be returned to their home country, if they come unlawfully. Children, because they are children, have been exempt from that process, so there is a bit more protection. However, given our mission, youth leaders can probably understand that there is no public defender system to date for children who are in immigration court proceedings. The Government has recently come up with some positive initiatives to provide counsel, but so far, it’s not 100% coverage. In that process, they do have some opportunities for legal relief in the United States. One is asylum, so if they are fleeing from persecution, or there’s a risk of future persecution. Another is special immigrant juvenile status, which is for children who have been abused, abandoned, or neglected by a parent, and are in need of … It’s in their best interests to not return to their home country, then there are visas for children who have been subjected to trafficking, which, unfortunately, does happen for some of these Central American children. Along the way, the smuggling turns into a trafficking situation. They get detained, forced into forced labor situations, or forced prostitution, and we have seen some children who are miraculously able to escape and make it to the United States. Craig: Are you providing direct legal services for these children or are you …? How are they finding you and what are you doing for them when they find you? Elizabeth: There’s a network of legal services providers. Once a child is apprehended by the Border Patrol, they are placed in Federal custody, and in … generally in shelters, although right now there are large emergency places being set up at air force base, in Laughlin, for example, and other places. Generally, there have been legal services providers that give the children orientations as to what’s happening, and provide them with a legal assessment of their case. In my organization, we have 8 offices nationwide. We’re the only agency that provides representation … free representation to children in such a large measure across the country, and what we do is that we get the cases from that legal network that meets with them in the shelter care facilities, and then we recruit, train, and mentor private law firm and corporate attorneys to take these cases. Craig: How much does it cost to have a child smuggled across the border? When a parent is here in the United States, they hire, or get money to a smuggler … what does it cost them to do this? Elizabeth: We’ve learned that it costs anywhere from $5 to $8,000, and most of these families are going into debt to raise that money. Whether the parent is in the home country, or here, a lot of them don’t actually have it on hand, which shows the level of desperation, particularly some of the families in Central America, going into debt with their land as lien on the debt. Craig: What ultimately happens to the children? Do they get sent back? Are they patriated here? What happens? Elizabeth: As I said, once they’re apprehended, and placed into Federal custody, if they do have a parent, or another relative, or someone who will take care of them, then they are released to that person, and then they do have to go through a legal process, the immigration court process, which can take quite some time, but the idea is then that system will decide whether or nor the child qualifies for any of the protections I mentioned, and if not, the child will be either ordered removed, or allowed to voluntarily return to their home country. Robert: Alex, you’ve looked at this issue, obviously, quite carefully, and studied the numbers. Where does this lead you to from a policy perspective? Should the United States be doing something differently here than what it’s doing now? Alex: I think we can all agree on immigration law should be done quite differently, not just for these children, but I think for everybody who wishes to come to the United States. One easier thing that could happen is to stream line all of the asylum process, so that a lot of people can … if it can be a less arduous process, take less time, have lower standards for what qualifies as violence, or, since a lot of people can get in under the asylum standards a lot easier. Another important thing we can do is if the unauthorized Central American immigrant population of the United States was legalized, then … and eventually given Green Cards and citizenship, or given those things that are … quite rapidly, then they could use the family immigration system to reunify with their children here in the United States, cutting out the smugglers, and replacing that with a bus or plane ticket on the legal market. Another way that I’ve heard recently discussed is to open up the UVs a bit more, and make it so that a lot of these kids with some help could apply from American embassies and consulates in these home countries, and get in through that program, expand that program, or reform it, to make it open to a lot of these people coming in. Then there’s, of course, a lot this streamlining would have to go on with the bureaucracy dealing with the 10 kids right now in the United States, getting them with the families more rapidly, who are here, giving them to the care of private organizations, like KIND, that are trying to help them out … Give them a cache to people in the United States and take care of them. Basically, as rapidly as possible, taking into account the interests of the child, of course, giving them into the United States and out of detention facilities, are some of the small things that we can do right off the bat to improve the situation for everybody. What’s the fundamental, basic public policy on immigration right now? Alex: The fundamental public policy system right now is that every single immigrant is considered to be bad for the United States unless they can specifically prove that they fit into a very narrow set of categories: a high skilled worker, sponsored by an American firm, if they are closely related to an American, small numbers of refugees and [asylees 00:24:42], and a diversity visa. If you noticed, I didn’t … There is no category for a low skilled worker without an American family to come here on a Green Card and to work legally, like almost all of our ancestors did when they came here. Alex: That’s essentially what the immigration policy in this country has been since about 1921 for some categories of people. Prior to that, like the Chinese, it was closed in 1882, so we did a real about face. The United States literally had open borders from 1790 to 1882, and then between 1882 and 1921 it systematically closed it to different groups of people on racial, ethnic lines, and other lines, and then from 1921 to ’65, it was largely closed off to almost everybody around the world, and it’s been gradually opening since then, but it is nowhere near the amount of openness that we saw in the early years of the American republic, or the late 19th century, and as a result of that, there’s still enormous economic reasons for people to come to this country. However, the legal system does not allow that, so we’re stuck with situations, unfortunately, like this, where we have people coming over unlawfully, and then they send for their children, or their children come over for other reason, because they’re pushed out by violence, and the legal system can’t handle it, because it’s not open enough. Robert: Elizabeth, what about you? Do you have thoughts from a policy perspective of how we should be responding to this crisis? Elizabeth: Yes, I would say the policy … We have to be careful not to have a knee jerk enforcement response. I think that’s what governments often are inclined to do when they feel overwhelmed by numbers or they see a big surge, and then to ensure that our … the US is a world leader in refugee protection. We receive the most resettled refugees in the world, and we provide the most funding toward refugee protection, and so we have to make sure that we remember that these are children and that they … many of them may have refugee protection needs, or they are fleeing violence, or domestic abuse, and that they receive protection. I also think it’s important to look at the root causes of the migration and have a comprehensive approach that’s not just based on immigration policy, but also on foreign policy, and then foreign aid, and invest in the child welfare systems, and rule of law, and security in these countries. Alex: Yeah, I think there’s no doubt that American policy, especially in Central and South American have to do with the drug war, and the funding that we give security and police forces down there to prosecute that war to an insane degree is a big part of the problem. The drug war has a lot of casualties around the world and the United States, but it seems to be hitting Central America the worse, so if we could pull back, or end the drug war, that would have a huge consequence. To people out there who say we need more enforcement, or a lack of enforcement is the problem, what we’re seeing right now, this ugly situation right now, with these horrible pictures of these kids in detention facilities, this is enforcement in action. It’s easy to sit back and be … and sit at home and watch TV, and hear about kids coming across the border, and saying, “We need more police on the border, and law enforcement and everything else”, and to have a gut reaction that these pictures are nasty, but these nasty pictures, a lot of them are the result of a heavy handed enforcement only policy, and what we need to do is have a legal immigration policy that works, [inaudible 00:28:23] these people will come legally, so they don’t have to resort to such desperate measures, like hiring smugglers to enter the United States. Craig: Do we actually have a separate policy for children, or is it just one policy, keep everybody out? Elizabeth: Pretty much one policy, right. Alex: There are some more protections for children who are brought in. Elizabeth mentioned some of those protections, but basically, it’s like most Government programs; a one size fits all very restrictive system that applies to everybody, poorly. Craig: We’ve just about reached the end of our program, so it’s time to wrap up and give your final thoughts, and your contact information, so our listeners can reach out to you if they would like to. Elizabeth, let’s start with you. Elizabeth: Sure. I think I would like to close by saying that we applaud many of the Government’s actions to date, to deal with the emergency, but we would really encourage more resources for the immigration court system, and more resources for lawyers for these children to ensure that their cased are heard, and to, again, look at these children as children first, and their protection needs. In order to contact me, our website is w w w dot supportkind dot organization, and my email is edallam, which is E D A L L A M at supportkind dot org. Alex: Cato’s website is C A T O dot org, where you can read a lot of my other writings on immigration. Basically what we’re seeing right now on the border with these unaccompanied minors is a tragic, unanticipated consequence of a restrictive immigration policy that does not allow people to come to this country lawfully, except in very rare circumstances. This is just a small microcosm that shows how broken our immigration system is and how desperately we need reform, so refugees, or asylees, for children, for adults, and for every other group of people. It’s not only good for the immigrants themselves, but also good for the United States. You can read more about this at Cato dot org, C A T O dot org, or, you can email me at anowrasteh, that’s A N O W R A S T E H at Cato dot org. C A T O dot org. Craig: Great. Thank you very much. Now, Bob and I have the opportunity to take 30 seconds to share our closing thoughts before we get cut off by the buzzer, so Bob, you’re up. Robert: I thought that Elizabeth really said it well, really, in the show, when she talked about this as a refugee/humanitarian crisis. It’s a horrible situation, and it certainly underscores and dramatizes the need for reform of our immigration laws, and more than that, on a practical and immediate basis, I just want to underscore, again, what Elizabeth said, which is that there are lawyers needed to help these people, and they can go to this organization’s website at supportkind dot organization, I’m looking at it tight now. The website has a lot of information on how attorneys, law firms, and corporations can volunteer their services, and get involved in this. Craig: I think we’re coming up on nearly a hundred years’ worth of an immigration ban, so it doesn’t seem to be realistic to be expected that any time soon we’re going to be changing the immigration laws, or reforming them, but I do think that its’ important to change those laws and reform them as it relates to children at a very minimum. Obviously, we protect our children in just about every circumstance that they get involved in, and it’s no different if the children are coming across the border, and they belong to somebody who wasn’t born here. They’re still children. They don’t know better. We need to take some steps to fix that and protect them, and I think we need to take some steps in the root country itself to try, as Alex mentioned, the drug wars causing a lot of this, and we need to give a lot of this immigration, and we need to give some thought about the effect on children, and what we can do in the Central American countries to protect them there so they don’t feel a need to travel across the border and put themselves in unsafe situations. Robert: We should explain that that little buzzer is our little timer that’s telling us we’ve run out of time, but I would just like to thank Alex and Elizabeth very much for taking the time to be with us. This is a really fascinating discussion, and your insights were really appreciated. Craig: That brings us to the end of the show. I’m Craig Williams. Thanks for listening. Join us next time for a great legal topic. When you want legal, think Lawyer 2 Lawyer. Thanks for listening to Lawyer 2 Lawyer, produced by the broadcast professionals at Legal Talk Network. Join Craig Williams and Robert Ambrogi for their next podcast covering the latest legal topic. Subscribe to the RSS feed on Legal Talk Network dot com, or in iTunes. The views expressed by the participants of this program are their own, and do not represent the views, nor are they endorsed by, Legal Talk Network, it’s officers, directors, employees, agents, representatives, shareholders and subsidiaries. None of the contents should be considered legal advice. As always, consult a lawyer.